Just recently a very generous friend gifted me with a trio of YSL lipsticks in varying shades of deep pinks and reds. A luxury present for sure, and one I am not sure I would ever have splurged on for myself (Ok, lying. That would probably happen). This gift, the ultimate in glamour, at least in my opinion, allowed me to forget for a moment that as much as I want to be, Im just not that girl. You know the one; oozing style effortlessly, able to wear a gleaming red lip with little to be self conscious about. I try. I promise I do. I walk up to the cosmetics counter, confidently asking to try on that gorgeous shade of red I’ve been dying to get, praying that this one will be the one. 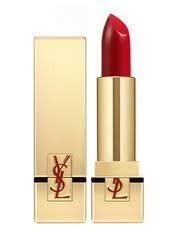 That I may have finally found it, the red lipstick that will instantly change my life. Without fail, I glance into the handheld mirror and almost simultaneously reach for the box of tissues. Whatever the excuse (my teeth are never white enough, I’ve allowed too much time to pass between my last lip wax… ) there is always some reason why I can never see myself wearing a shade of lip color thats not my own. Still though, I may never let go of that secret dream, to be that girl who can stun a room with her casual elegance and beautiful red lips.